The programme was loaded with subtle and not so subtle anti-fracking messages, including hints about how clean wind and solar power are, emotive film of protestors, some lady with horses who lives in the middle of a field, repeated mention of earthquakes and pollution, not to mention the rather misleading photo above which gives the impression fracking sites are much bigger than they really are. On top of that was the failure to give any serious consideration to the benefits. One of his most misleading statements concerned the report from DEFRA’s Air Quality Expert Group (which he implied the government had tried to suppress), who, according to Heap, claimed that anyone living near a fracking site could see their air quality suffer. In fact the report makes clear that most of the pollution will arise from normal construction activities, eg lorries, diggers and drilling. In other words, nothing different from any bog standard building site, or for that matter wind farm construction site. Moreover, these periods of disruption are just for a few weeks. The report also makes clear that emissions of methane from extraction activities can be controlled by flaring and proper control procedures. The programme then wheels on Richard Black, from the renewable lobby group ECIU. Heap asks him if it would be better to have our own supply of gas rather than importing. Without any sort of a challenge from Heap, Black is allowed to claim that it would make no difference as the gas is privately owned by Cuadrilla, meaning there is no benefit for the UK. Heap fails to point out the very real benefits, such as jobs, tax revenue and energy security. He also fails to challenge Black’s assertion that shale gas will have a short shelf life, as we will all be going renewable. If he is right, it is Cuadrilla who will lose out. Which brings us to the heart of the matter. Neither the National Infrastructure Commission (who Heap misquotes), the National Grid nor the Committee on Climate Change say we won’t still be using huge amounts of natural gas, even by 2050. They all recognise there is no serious alternative to gas for providing back up power for renewables. And although they would like us all to convert to hydrogen for heating, the only practical way to produce hydrogen in bulk is to use gas as feedstock. Yet this was not mentioned at all by Heap, who instead prattled on about renewable energy. About the only counter to the anti-fracking message was a short interview with Francis Egan, boss of Cuadrilla. There was little attempt at real balance. Why, for instance, was there no mention of investigations by the Royal Society and Royal Academy of Engineering and the British Geological Survey, both of which found that fracking was a perfectly safe activity? Or that construction of wind and solar farms is also unpopular with those affected? Above all, that if we want to continue to enjoy our current standard of living, we have to accept a certain amount of disruption to our lives. This is typical of the BBC’s bias. Nothing new here – Tom Heap has always pushed renewables from a one-sided point-of-view. A real advantage of fracking from the point of renewable energy is its ability to hide the limitations of renewables. California highlights the strides it’s made in renewable energy while getting 60% of its power from natural gas. Not only do natural has power plants throttle up and down quickly, low cost gas keeps power bills down, keeping the renewable illusions alive. No wonder the British public are so misinformed when the main British broadcaster disseminates so much false information. It is more than just bias it is outright falsehood verging on criminal fraud. So much public money has been squandered on the folly of so-called renewable energy but a few have become incredibly rich but the bulk of the population has been impoverished paying the huge bill of government subsidies. In Ryedale the proposal is for ~ 1000 fracture wells which will penetrate through the Corallian aquifer, the source for drinking water around here. It would be helpfule to hear what is done to these wells once decommissioned to minimize risk of contamination of the aquifer, especially over the longer time period, say 50 years. Anti-frackers claim the failure rate of well casements in the US has been high (~ 15% over 10 years of so IIRC). My understanding of the Environment Agency assessment of the risk of acquifer contamination is “very low” but not zero. Yes, saw it. It was the usual piece of crap reporting from BBC and Countryfile. Tom Heap’s reporting is of an appalling low standard, uninformed, unbalanced, incorrect, and as for wheeling in Richard Black, it reduced the level of the programme even further. At no time did he try and highlight where our energy needs are going to come from, just glibly mentions renewable energy, which in itself can never meet the country’s energy needs. And we have to pay that incompetent guy’s salary through our TV tax. Gas is owned by the Crown, not by Cuadrilla. The Crown grants a licence to explore for it and to extract it. Black should go back to school before he starts teaching more lies to BBC journalists. It was a disgraceful report by the BBC, heavily-loaded in favour of the anti-fracking lobby. Because of my interest in fracking I ‘attended’ an online course run by the University of Nottingham which clearly set out the economic and environmental realities of fracking while shooting holes in all the claptrap pushed by Greenpeace et al. We need fracking for gas as soon as possible, noting that we have been fracking for oil in Dorset for decades without any fuss! The Vladimir Rusanov is currently off the Northern coast of Norway – bound for Grain LNG terminal. Of course, it may be that the cargo will be transshipped to Asia, as many Yamal cargoes are at Montoir (next to the famous St Nazaire dockyard). Thanks for reminding me of a great bit of Ezra’s poetry, Ancient Music, I think. However, back to topic, we probably need to get Russian LNG as our winter storage capacity is depleted by the loss of the Rough field. The hysterical anti-Russian hype should be treated with some circumspection in my view, as in Germany. The armaments lobby in the USA and Europe are on their push for budget increases: seeing invisible submarines etc. Inadequate gas will mean either power cuts or possibly, heating cuts if the weather is as last year: but we will have lots of missiles. Rough is an off-shore store not a gas field. The government showed no interest in it being kept in use so Centrica – having suffered months of a reduced share price due to the Tories energy cap plan – saved themselves the money by closing it. At the end of March last year we relied on the gas interconnector to keep things going. With our ‘no deal’ Brexit the interconnectors close down with our exiting the Single Energy Market. If it is very cold at that time we might see our first energy cuts. Biased Bull$hit Cartel at its best. I missed this episode of country file but I assume Heap was reporting from Lancashire. I have an old Geol Survey report (1954) which mentions the Keuper sandstones , impregnated with mineral oil in the Formby area , which, in the 1950s was producing small quantities of oil at 2000 gallons /week. So fracking for gas is just a logical extension of a historically established activity. Was Heap aware of this? If he was would he mention it? One does have to wonder at the producer, the script planning and the meetings which led up to the piece. Heap is simply the talking head at the end of that process. Many people lead busy lives and do not have the time to X-check claims and they take CountryFile as reasonably authoritative – the BBC doing the honest, diligent unbiased spadework. The drip, drip of propaganda. I wonder if Richard Black got paid (extra appearance fee / honorarium) to appear? – given the talent for enhanced urine extraction in the BBC – I would not be surprised. The programme could well have been made by Russia Today – all those Putin stooges killing off British jobs. When you strip-out the obvious editorial bias, RT and Al Jazeera are far more honest than the BBC or ITV. Far less focus on trivial debates about what might happen tomorrow in Brexit / Tory party / labour party etc and little mention of inconsequential celebs. Fortunately, the fat-controllers have not been able to censor the internet so far. 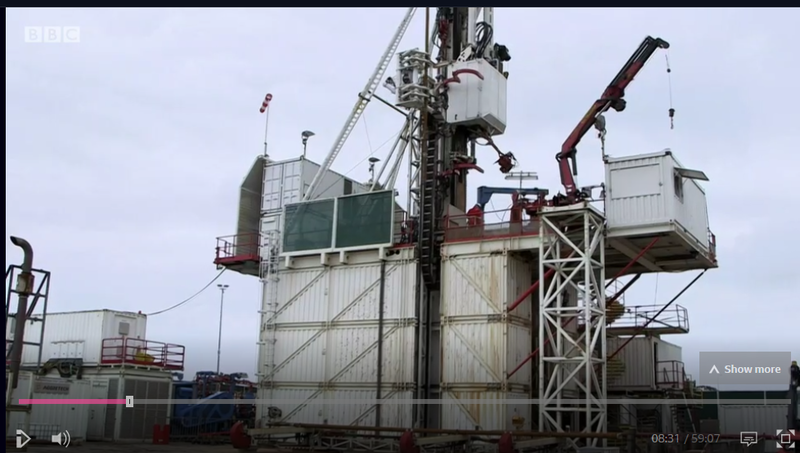 Firstly, I was heartened to hear Professor Mike Stephenson of the British Geological Survey say on the video that we should use the term “earth tremors” rather than “quakes” for the tiny vibrations in Blackpool which might have been caused by trial fracking. Britain has quite a lot of earth tremors, some of which cause minor structural damage, but it is usual to refer only to the rare bigger ones as “earthquakes”. Secondly I understand that the Identity Card carried by senior BBC staff and journalists carries the following wording as a reminder of the Corporation’s mission: “Trust is the foundation of the BBC: we are independent, impartial and honest”. A worthy philosophy indeed, but totally incompatible with an organisation which takes a prior stance by deciding which side of the argument is the correct one, as was evidenced by Fran Unsworth’s ruling on Climate Change. Oh, and a postscript. Does Tom Heap write his own material, I wonder? Or is it cobbled together by an editorial team from Greenblob press releases etc? Was watching the Test highlights so missed it. That’s why my TV is still in one piece this morning! BTW, Paul. If you have time take a look at today’s DM: The Answers section on page 58. There’s a question about the Swansea tidal barrage. The answer from a Dr Ken Warren reads like something Black would write. It’s classic B.S..
‘Countryfile’ tales from the farmyard for consumption by the townies and the countryside weekenders/green welly brigade and done by, one country boy and the host of metropolitan lefties. They hate the idea of fracking but love the idea of a warm house, some cognitive dissoance afoot, ahoof………… there methinks. I’ve watched the programme again, and it reveals the difference between people who work in the real world and people like BBC employees and NGO employees such as Richard Black who get paid a handsome salary regardless of the quality of the crap they produce. In the real world, people have to rake risks: such as farmers who invest in machinery and plant crops without knowing whether they will be successful; or geologist who explore without knowing whether they will find anything; or researchers and developers who can invest years of work without knowing if anything successful will be the outcome. About 18 years ago I ran a project which potentially could deliver huge benefits but could also be a complete failure. At the outset we had no idea how long the project would take, how much it would cost and what the chances were of success. Fortunately it did deliver the hoped for benefits. BBC employees have no idea of life in the real world and the need for private enterprise to take risks and then, hopefully, to reap the rewards. The BBC should be sold off and take the risks of life in the real world instead of life in its cosy fantasy world. It wouldn’t then be so easy for it to get away with its bias and its output of lies, misleading information and pure propaganda. If, as they proclaim, the BBC is an unbiased broadcaster on behalf of their licence payers, then can we ask them to do another programme based on the ‘benefits’ of fracking to our economy, allowing genuine experts on all aspects of the subject to have their say. I think I just saw a pig fly past the window…………………!! Hope it doesn’t go through the blades of a windmill! Mind you – bacon falling from the sky, what’s not to like? And one on the disbenefits of “controversial” renewable energy developments. The BBC are far from alone in their perpetually biased and misleading reporting. Last weekend’s “i” newspaper carried a full page article on how a homeowner had slashed his energy bills by installing solar panels and, more recently, battery storage. Big headlines proclaimed a massive reduction in bills and the article explained how the panels had paid for themselves in 5-6 years. There was no mention of the fact that, when the guy bought his panels, the FIT was almost 3 times higher than it is today. Nor did it explain how his cost saving is paid for by the rest of the population. Clearly it was another puff-piece for renewables. The author was either ignorant of the facts or chose to present an utterly misleading picture. My money would be on the latter. Next week I expect they will run a feature on how to get rich by purchasing Apple shares 15 years ago! and there’s another 14 years of FIT payments to go…. And they don’t explain the Australian state (likely SA) is only 1.7 million people. And that they would likely only get a few minutes of power if the battery was the sole source of energy. Let’s do the arithmetic. Australia’s stats department gives South Australia’s power consumption in 2016 as 326 petaJoules. At 278 Gigawatt-Hours per Pj, this gives an average consumption by the state as about 248 GwH per day.Now this runs out to 10345 Megawatt-hours per hour. SO, if this Musk battery really does supply 129 MWh, it will therefore supply the state for 129/10345 hours, or about 44 seconds. So what, exactly, does spending this HUGE amount of money actually SOLVE? It was an anti-fracking, anti-gas, anti-fossil fuels pro-renewables pro-climate change hit piece, which stayed *just* on the safe side of outright propaganda. Think of it as the media equivalent of a crafty foul from the footballing Dark Arts manual that concedes a foul but not a yellow or red card. They’ll take criticism from a low-reach blogger (sorry Paul!) because the much wider TV audience swallowed the message while having no idea they were being played. Paul and the merry crew of this parish can see through the BBC’s (as ever very slick) shenanigans but the average viewer will’ve been subtlety influenced against fracking and in favour of renewables and ‘tackling climate change’. Exactly as intended. The state of Ohio has been on the forefront of fracking. University of Cincinnati researcher, Dr. Amy Townsend-Small’s study was actually suppressed by the University for several years as her findings were not in line with those wished by environmentalists. She dealt with methane in water wells which occurs naturally in these areas. Another study from Miami of Ohio University looked at earthquake activity from fracking. It is more of an overview and actually did not make conclusions about fracking. However, the geologist speaks about the need to balance consequences with economic needs. The little video is an impressive statement. All of these publications are from 2018. More utter nonsense on the One Show on the UK/Norway interconnector – this is a green project apparently. We will be importing beautiful green energy from Norway when it is cheaper. But they said the UK will sometimes be filtering out all the electrons from our excess wind and solar and sending it to Norway. Somehow I think it will be almost 100% importing from Norway. £1.5Billion and no mention of who is paying or why it is required. According to Wiki it may save UK bill payers £2 (per bill???) over 25 years, whatever, it is so marginal as to be pointless. The interest from £1.5Billion would have yielded more? And it will probably actually put up prices for Norway consumers! But of course the cable operator is quids in whichever way the power goes. I have to say this. I hate the idea of fracking because it decimates the landscape as can be clearly seen by looking at fracking operations in US on G Maps. It DOES cause earthquakes. This is Undeniable Truth and can easily be demonstrated. There is channel on YouTube called dutchsinse and this guy has been monitoring and Forecasting earthquakes for years. He often zooms in to see the exact point of a quake and it is Often where there is a fracking drill. This is a lot more than coincidence. The quakes are usually small and clustered so can be seen to be different from quakes caused by natural deep underground movements. Fracking does not decimate the landscape, the footprint of the type of operation coming to the UK is no more than a National Trust car park, and they will be screened and returned to the natural state after use. As for earthquakes – cobblers, very very minor tremors, far worse are already produced in the UK by mining, quarrying, tunneling for cross-rail and lots of other activities. Were you on the receiving end of the piling works for the Rampion windfarm – I was, night after night of house shaking and sleep disturbance from work 10km away. What does decimate the landscape is windmill industrial complexes and fields of solar panels.